This is Thai Chat (pron. ty sha). He was a Korat; a breed from Thailand known as "the silver-blue cat with a Thai passport." But more than that, he was a true companion. He left us in 2001 and he is sorely missed. He turned 16 years old on January 28, 2001. He lived a full and happy life and remained loving and purring to the end. I wasn't planning to get a purebred cat when I went with my brother and a friend to visit a breeder many moons ago. But the kittens were so cute and the adults so friendly I was smitten. These cats are truly companions and they crave affection as much as food. You can read more about Korats in this Korat profile. Here's a picture of Thai when he first came to live with me, 4 months old. To the right is Thai's brother, Jai Dee, who lives with my brother. He's on one of his favorite spots, a warm tv set. Would you like to see more of Jai Dee and his friend, Mani Tau? Here is Mingus, a Red Abyssinian. He was 15 years old as of July '03. Mingus was very affection and loved to snuzzle you with his head and would purr loudly and with much passion. He had a happy life and made us happy, too. My first encounter with this breed was when I went to a cat show looking for a bargain on a cat tree. Their fur is striking and I couldn't resist the color combination with Thai Chat's silver blue :-). This is Rahsaan, he was my first Aby. He was a wonderful, friendly cat (and he had a really long tail :-) Thai and Rahsaan grew up together and were great pals. Unfortunately, Rahsaan died from an all too common heart disease when he was only 3 years old. Information about Abyssinians can be found in this Abby profile. Thai seemed lonely during the next few months and getting another Aby seemed like a good idea. I wasn't sure how these two were going to get along. They didn't seem to hit it off very well in their first meeting. Over time they went from the initial curiosity and fright to becoming quite accustomed to each other. At times they thay can be somewhat indifferent towards each other but for the most part Thai Chat and Mingus are happy housemates. In the summer of 1997, Thai Chat and Mingus accepted a new friend into their home. Her name is Pumpkin Pie and she came from Maine. The adjustments were not as traumatic for the three of them as we thought they might be. Within a few weeks, well I wouldn't exactly say thay are best friends but they do get along and are happy together. "Pet us and we'll purr and meow for you"
Click on cats in various places for 7 different sounds in .wav format (10-50K). Who's this big creature and what's she doing here? She's kind of cute, though. She's Hailey, our Long-Haired German Shepard. She was about one year old when we rescued her from our local SPCA. She has a wonderful temperament and I'm sure it won't be long until we're all used to having her around. Our two recent arrivals, Jon Li and Meisha. In this picture, Jon Li, on the left, is a 4-month old and Meisha is 18 months old. Jon Li has already grown quite larger than the little girl. See more of Meisha and Jon Li. We appreciate the folks who have come to visit. 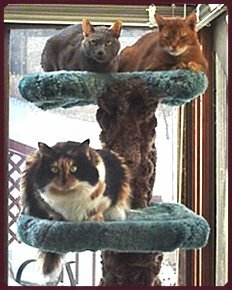 Cat Fancier's Association breed profiles for Korats and Abyssinians. Korat World is a wonderful resource for Korat owners and breeders maintained by Donatella Mastrangelo, in Italy. A group called "Expertise" hosts a very good Home Safety Guide for pet owners. Cat Fanicers Chat (not to be confused with the CFA) also has some useful links and information.